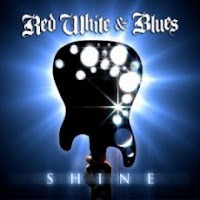 RockUnitedReviews: RED, WHITE & BLUES: "Shine"
RED, WHITE & BLUES: "Shine"
Way back in the mists of time, before records began, there was a band called Jagged Edge. Okay, so it was only the early 90’s, but it sure feels like a long time ago. They had a go at the melodic rock thing and did a good job, but the timing wasn’t great and the fizzled out. Guitarist and songwriter Myke Gray went on to success and record company battles with Skin, whilst vocalist Matti Alfonzetti has done a variety of good work both solo and in bands. Well, in case it wasn’t obvious, Alfonzetti and Gray are back with a new project, and Red White & Blues is the name. Myke Gray sure likes to keep busy, and we should all be grateful. Last year’s Skin revival was a critical success, resulting in a great album, with “Shine” being a great follow up for him, although the two are different beasts. Alfonzetti himself delivered a very good solo effort, and it has to be said that this album manages to take bits and pieces from the two artists previous efforts and build on them beautifully. As the name infers, there is an amount of blues at work here, but don’t think that Gray has decided to go all Gary Moore on us, as “Shine” is more Thunder/Bad Company style (check out the title track for a hefty dose of 70s blues)with a side order of AC/DC. Hell, there’s even a dose of Y&T as Alfonzetti tells a tale that includes the clichéd line “Me and the boys wanna have some fun” in the shallow yet catchy “Good Time”. Alfonzetti is worthy of praise throughout, as his voice has stood the test of time as well as any, and he’s a towering presence here, taking command of every song on an album that at the right time would have been considered a classic. This isn’t to say that Gray doesn’t earn his stripes, because as ever he’s a constant force behind the frontman, throwing out licks and solos that are never showy but always worth listening to. SIMULACRUM: "Master And The Simulacrum"
IAIN ASHLEY HERSEY: "Vintage Love - The Best Of"
THEOCRACY: "As The World Bleeds"
ANNO MUNDI: "Cloister Graveyard In The Snow"
TRUCKER DIABLO: "The Devil Rhythm"
COASTLAND RIDE: "On Top Of The World"
M & R Rush: "Alpha"